The message of Kopimism is spreading around the world. Copying Information is a Holy act. Kopimism worships no gods. Copying and sharing are our religious right and duty and religious service. If you want to join the Church of Kopimism, please sign up here. Tell your friends and neighbours. Speak about the message of copying information. We appreciate and read all e-mails. We may reply via IRC channels or Twitter on the go. Keep your IRC ID Private!! Canipre,a Canadian forensic software company, has illegally collected data on a million Canadians who it says have illegally downloaded pirated content. The company has files on one million Canadians who've downloaded movies via BitTorrent over the last five months, identifying them through IP addresses. Learn how to do the holy sign. Watch the video. Spread the message about copying. Below you will find a section with our Constitution, links to other centers around the world, updates on the status of the movement and useful information in how to comunicate digitally around invasive and represive laws disguised as Intellectual property protection, or surveillance laws that attack basic human rights, like the right to privacy. Copy & Seed! The Church of Kopimism is recognized by the state of Sweden Just before Christmas 2011, the Swedish governmental agency Kammarkollegiet registered the Church of Kopimism as a religious organisation. This means that Sweden is the first country to recognize kopimism as a religion. The Church of Kopimism have tried to become registered as a religious organisation by Kammarkollegiet for more than a year. - Since Kammarkollegiet has been strict with formalities, we had to apply three times, a happy Gustav Nipe – board chairman for the organisation – says. He continues, I think it might have something to do with the governmental organisations abiding by a very copyright friendly attitude, with a twisted view on copying. For the Church of Kopimism, information is holy and copying is a sacrament. Information holds a value, in itself and in what it contains, and the value multiplies through copying. Therefore, copying is central for the organisation and its members. Being recognized by the state of Sweden is a large step for all of kopimi. Hopefully, this is one step towards the day when we can live out our faith without fear of persecution, says Isak Gerson, spiritual leader of the Church of Kopimism. The Church of Kopimism is a religious organisation with roots from 2010. The organisation formalizes a community that’s been well spread for a long time already. The community of kopimi requires no formal membership. You just have to feel a calling to worship what is the holiest of the holiest, information and copy. To do this, we organize kopyactings – religious services – where the kopimists share information with eachother through copying and remix. Copy and seed. Al Tab: Kopimism vs. SOPA - One of the many threats to Freedom of Information Sharing. Religious services in English, French and Spanish. We appreciate all e-mails. Requests for interviews will get a timely reply whenever possible. March18/2014: In surprise TED appearance in Vancouver, Edward Snowden! Blessed be the little copy! and lead us to the eternal nothingness! concentrating their excess towards the sky. For in Aleph 1, the machines could be in other machines. the uncertainty relation was internalized into kopimi. Instead: the mantra “I don’t know”. in torrent, as it is on the disk. but make us a port-forward to the torrent client. For thine is the copy, our power and top ten downloads. The Church of Kopimism in rapidly expanding, we have over 6000 registered members. Besides Sweden and Canada, other countries have started their own churches. Above is a partial list of where The Missonary Church have been growing. In some of these countries, Kopimists are already working to obtain recognition from the government. We embrace you. It’s of grave importance that we copy the message to all the continents. All knowledge to everyone is the minimum goal. Spread the message as good as you can. Today, a debate article was published in one of Swedens national newspapers by several antikopimists. The words were burning with hatred and hostility. They encourage persecution of information and an alarming primitivism filled with reactionary anti-internet propaganda. They refer to Sweden as the “pirates paradise”. We think that Sweden being the pirate paradise is problematic. The paradise shouldn’t have borders. We encourage the swedish government and foreign department to draw up a plan to export the swedish pirate success through intergovernmental organizations and foreign aid, so that all the people of the world can live in copying, internet and love. We bless everyone who’s building the paradise of pirate copying every day, through their personal computers and servers, through their mobile phones and their pads. Copy is holy, copy is right. Copy and seed. Below is the first English translation of the Kopimist Consitution. It has not yet been reviewed by the Swedish Kopimist Council for official status, but we hope to obtain that soon! - Copying of information is ethically right. - Dissemination of information is ethically right. - Copying or remixing information communicated by another person is seen as an act of respect and a strong expression of acceptance and Kopimistic faith. - The internet is holy. 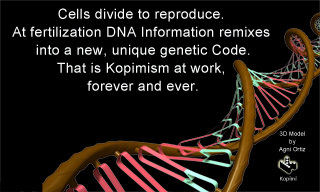 Members of Kopimism (Kopimists) and Church of Kopimism recognized religious representatives (Operators) dedicate their lives to living in accordance with these axioms. The only correct way for a Kopimist to live, is through the sanctification of these religious foundations. The Missionary Church of Kopimism has formalized a community that now exists around the the value system described. This fellowship extends across national borders and time zones. To belong to the Kopimist community, one need not be a member of any organization. It is enough that one feels called to respect and worship the holiest of the holies, information. Worship through meditation is sufficient to be considered part of the Kopimist community. A person who identifies with our philosophy, whether or not formally registered with the Church of Kopimism, we consider a Kopimist. No Kopimist is wholly self sufficient, each being just one component of an interconnected and interdependent world. An op is a spiritual leader of the Church of Kopimism, and can only be appointed by another op. 1. Live in strict accordance with the values and regulations outlined herein. 2. Assist other Kopimists in living according to Kopimist values. 3. Actively shape their environment to harmonize with Kopimist values. Each op’s primary function is to consecrate information value. Ops are encouraged to actively copy, remix and share information, and participate in religious services, through which Kopimism’s strongest religious foundations are expressed. Ops are tasked with the organization and leadership of the worship service for all of the community. monitoring or recording of worship activities takes place. Because of society’s vicious legislative and litigous persecution of Kopimists, participants in the service are expected to encrypt their traffic. In the digital service, the Congregation first ensures that those in attendance can communicate with each other via a compatible internet protocol, via for example a local area network, Internet or Bluetooth connection. expressed in the Missionary Church of Kopimism values, Missionary Message and Constitution, as much information between each other as possible. This is the holiest foundation of Kopimism. The final part of the worship is to engage the public in the practice of Kopimistic values. Members are encouraged to pass on the information obtained during worship to others. At the cessation of worship, when direct contact is possible, all members involved will submit “thx” to their Congregation. The second part of the open secondary task is to assist the Community in counseling. Pastoral care can take place between any Kopimists in the Community, but it is a moral obligation of the operator to assist with pastoral care upon request. Any believer may seek counseling from an op. Pastoral care requires a connection of the same kind that occurs in the service, because the connection consecrates the holy bond between the op and believer. In repressive states where public electronic monitoring is taking place, encryption is recommended to ensure privacy of pastoral care. When an op performing the secondary task, he or she should be clearly marked with a Kopimist symbol. The tertiary task is to conduct a public opinion to get the community to adopt Kopimistik values. Ops should drive public opinion against invasive surveillance and the laws that limit information dissemination, copying, and remixing (deceptively referred to as intellectual property laws). In addition to the original ops, appointed at the founding of the Church of Kopimism, new ops may be recognized in a Kopimist sacred operator-granting ritual, known as ‘giving op’. Thus, a kopimist an op when an op op gives to him kopimisten. To confer the title of operator, an existing operator muse sponsor a practicing Kopimist. The candidate Kopimist must obviously be living by Kopymist values and traditions, worshipping with regular frequency and showing a genuine concern for the well-being of the Community. Any time after a recognition of sponsorship takes place, the ceremony will begin with the connecting of devices by a compatible protocol. The sponsoring operator will transfer a Kopimist symbol, the sacred kopimipyramid, to the receiving Kopimist. After transfer of the symbol, they will simultaneously say “copied and seeded,” bringing an end to the ritual and finalizing the formal recognition of the new operator. kopimistsamfundets symbol throughout this the document. It is, however, quite permissible for individuals to depict, copy, and remix any icon and call it the Kopymism symbol. Operators may, at their discretion, also copy, remix, and adopt alternative symbols, however it is of the utmost importance at they also remain stewards of the traditions set forth in these documents. Therefore, all operators are required, when conducting their official duties (such as during worship, pastoral care, and the ritual of giving op), to use an official Kopimi-piramid in the transfer as described above. The key combination ‘ctrl C + ctrl V ‘is a deeply sacred representation of the act of copying, and therefore should treated as such. Interaction points are sacred sites that should remain free from andi-Kopimist monitoring and actions. The interaction point is identified by a depiction of the Holy Kopimi-pyramid. An operator will place the Kopimi-pyramid and pronounce the phrase, “I do hereby declare this a local interaction point. Copy and seed .” Interaction points can be inside or outside any dormitory, dwelling, public space, or private space. The Holy Kopimi-pyramid should always be present in interaction point rooms. The missionary task concerns all Kopimists, but is only obligatory for ops. The missionary goal is to influence others to adopt a more kopimistic outlook on life. In almost all countries there are intellectual property laws. Intellectual property laws are inherently discriminatory. Society generally tolerates these egregious violations of our intellectual sovereignty and freedom. Therefore you have to – if you follow missionary mandate – participate in societal conversations to increase the level of resistance to anti-Kopimisticism laws. The anti-Kopimisticism laws and lobbying organizations operating are modern incarnations of censorship. The missionary mandate also includes public opposition to the laws prohibiting or preventing encryption (analog, such as digital). Encryption is important in repressive states to perform divine service and pastoral activities undisturbed, and without any threat to the security of believers. In today’s society there are prolific anti-Kopimist breaches of privacy rights and freedom. These are completely legal. from others is comparable to slavery. Second, the use of tools to intentionally prevent copying of distributed materials should be banned. Any technique that seeks to information resources to slavery and should be banned. Those who take on the missionary mandate are encouraged to strive, when the law allows, for public code and data release. the common foundational beliefs consistent with Kopimism as specified in this document. B. The missionary Church of Kopimism is based in Uppsala. because that is specified in the document, and that it shares the same religious activity, as also indicated in the document. D. The missionary Church of Kopimism is a missionary society in the community, harboring a normative attitude towards the surrounding community. Through advocacy and spiritual leadership, Kopimists defend their Kopimistic values and beliefs regarding the proper societal handling of information, which are specified in the evangelical message of the document. Community’s purpose is to prostletyze the Kopimistic message in accordance with the ideas expressed in this document. It evangelizes the message and values in this document. Appointed ops may lead Kopimists in their religious quests and worship. and make recommendations to the churches. B. The Kopimist Conference meets annually at an Annual conference at a time and place decided by the Kopimist Council. Notification of conference location and scheduling will be issued 6 weeks prior to the start the conference. The Council will release an Annual Report, which will contain a list of Council members and mission Directors. C. The Kopimist Council may call special conferences at their discretion. Ad hoc conferences will only be called to deal with extraoardinary matters pertaining to the Kopimist faith. A notice of ad hoc conference will be issued at least 2 weeks before the conference. These conferences will be limited to discussion of the topic(s) outlined in the notice. D. The Kopimist Conference consists of all Kopimists who wish to attend. E. The Kopimist Conference makes decisions in open vote, unless it collectively decides otherwise. Selection of Members of the Kopimist Council shall be by secret ballot. other. Event of a tie in the sitting chairman of the meeting breaks the tie except during elections. In the event of an election tie, the selection will be chosen by lot. F. Proposals for Kopimism Conference agenda items will be accepted and considered by the Council up to 4 weeks before the conference. The Board shall deliver all proposals received. Second: Presentation of annual report and annual report for the preceding fiscal year. Third: Presentation by the auditors’ report. 4th: Explanation of income and balance sheet. 5th: Decisions regarding discharge to the kopimiststyrelsen and mission manager for preceding fiscal year. 6th: Determination of the operational plan and budget – for the following financial year. 7th: Election of members of Kopimist Council. 8th: Selection kopimiststyrelsens President, selected from Council members. 9th: Election of auditors and substitutes for them. 10th: Election of members, the Chairman and Vice Chairman of the Council. 12th: Matters that the Council presents for discussion. 13th: Statements of current issues, as the Conference decides to pursue discussion. and consists of six members, chosen by the Kopimist Conferece for a period of 2 years. Three Council members will be elected each year. accordance with Kopimist Conference decision. act on behalf of the Council in some cases at the Council’s discretion. Constitution and under the decision of the Kopimism Conference. - Decide to join any secondary cooperative bodies. F. The Council shall take roll over The missionary Church of Kopimism. H. The Council is convened by the chairman or in the presence of at least two Council members. The Mission director is entitled to participate in discussions and have their input recorded in the minutes. I. The Council is able to meet quorum when at least half the members are present. It takes decisions by open vote. If a Council member requests so, then a vote shall be conducted by secret ballot. In the event of a tie in the, the chairman of the meeting will act as tie-breaker, except the during elections, when the tie-breaker will be determined by lot. Kopimistsamfundets spiritual leader and principal representative. Mission Manager’s specific duties described in kopimistordningen. C. Mission director is elected for a period of 1 year and may be reappointed for further periods of 1 year. All Kopimists are eligible for the Mission director position. For selection of Mission managers, 2 / 3 majority vote must be obtained. choices of board of directors, auditors, the chairman and Vice Chairman. the Committee Chairman at least 4 weeks before kopimistkonferensen. Proposers must ascertain that the proposed desires to serve on the council. The Election Committee may add candidates at its discretion. ballot paper before elections are held. D. Kopimist Conference will appoint members for the Election Committee to handle the following year’s conference. A. The missionary Church of Kopimism’s fiscal year is January 1 – December 31. C. The annual report, accounts and administration shall be audited by two auditors appointed by the Kopimis Conference. By the auditors The missionary Kopimistsamfundet Values, missionary message and Constitution should be certified. D. The auditors must follow the business and financial management. They shall, after Review present their findings to the conference and provide drafts of the fiscal year’s income statement and balance sheet, the responsibility ofwhich will then be discharged to the Council. the Kopimist Council. All work conducted through FUK will adhere to the Missionary Church of Kopimism’s central tenets. ß 9 Dissolution of the missionary Church of Kopimism. agree to hold the dissolution vote. A. Amendment of the missionary Church of Kopimism Constitution can be ordered by the Kopimist Conference. B. To change the name of the Church, principles and bylaws shall be decided by 2 / 3 majority the present Kopimists. C. To amend ß 9 requires identical decisions at two consecutive regular Kopimist Conferences. Help others receive the holy message!